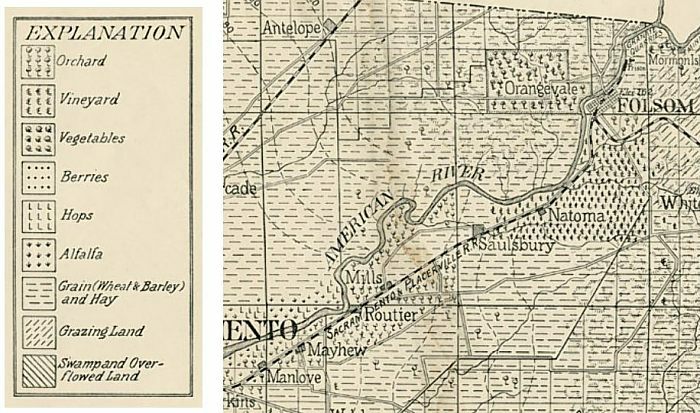 Another perspective of the Fair Oaks area in 1894 is shown in some cuts of an agricultural map of Sacramento County. The source for this map is the collection of the Sacramento History Online website which you'll enjoy visiting for all of its resources. Click here for the full map and credits. We know from many photos of the early Fair Oaks area that a substantial part of the area north of the river was in grain crops, and this historic agriculture map shows that. The large Natoma Vineyard is clearly shown south of the river, but there are only a few scattered orchards.